St. Paul's Episcopal Church > Fellowship > George and Cathy: a Picnic Contest: It’s a Tie! George and Cathy: a Picnic Contest: It’s a Tie! It was a tie! George and Cathy each collected $590 for a total of $1180. Thank you so much to those of you who contributed to the competition. 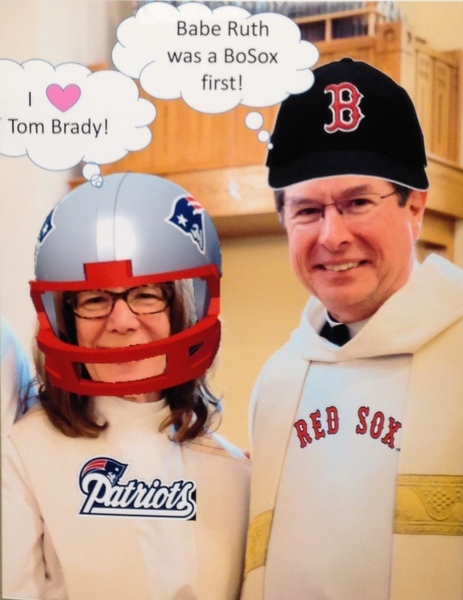 Come to this Sunday’s 10:00 AM service and picnic and see the competition’s completion: George will be wearing his Red Sox gear and Cathy will be wearing her Patriots gear (under much protest!) J. And remember, it is George’s birthday, too!